Identiflyer Lyric - Learn to identify the bird songs you hear. 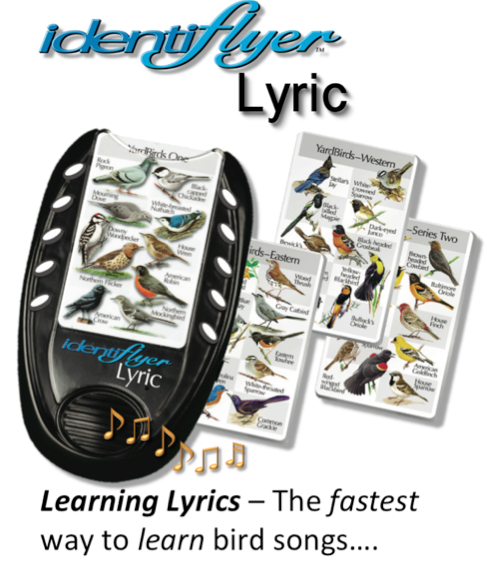 The identiflyer Lyric - The fastest way to learn bird songs! Click here to order. 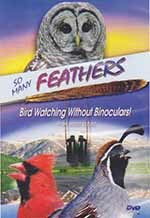 Automatically inlcudes the So Many Feathers DVD - a $10 value. The problem is: How do you become an expert? Bird experts are usually good musically and can recognize the notes of the bird’s song, but the average birder has difficulty learning these musical skills. No one, until now, has been able to help novice birders learn the songs. The IdentiFlyer Lyric solves this problem with Learning Lyrics, words and phrases that help you connect the music to the bird. For example, “Drink your tea” sounds just like the Eastern Towhee’s song. “Hula hoop, hoop” sounds like the Mourning Dove’s song. The IdentiFlyer Lyric makes learning bird songs easier for the non-expert because you hear the bird’s name, see its picture, hear a verbal description of the song (lyrics) and then hear its song. .....Lyric Mode – makes it easier to learn the songs and test skills. An improved speaker plays richer, crystal-clear bird songs; many songs are longer. Super SongCards* – Fewer cards are needed because each card has 20 bird songs, 10 birds on each side. Special Offer! To celebrate the introduction of the new Lyric we are including the "So Many Feathers" DVD at no additional cost. This 60 minute DVD includes many of the birds on the song cards, but in motion - singing and raising a family! This beautiful DVD normally sells for $19.95. On sale now at $10.00 or included free with the Lyric!